Create fake Instagram messages chat and generate screen-shots that looks like real Instagram chat. Life is boring, lets make its funny and enjoyable. In this social world, we see different funny chats which make us laugh. Obviously not all of them are real chats, people use such simulators to fake Instagram messages simulator and then prank their friends and family. For this purpose, we developed such an ultimate Instagram Simulator which will help you to create fake Instagram chat with your words of desired messages. You can create your fake chat with anyone even with Imran Khan, Trump etc. Check-box, if you want to hide/show Instagram messenger buttons at the bottom. 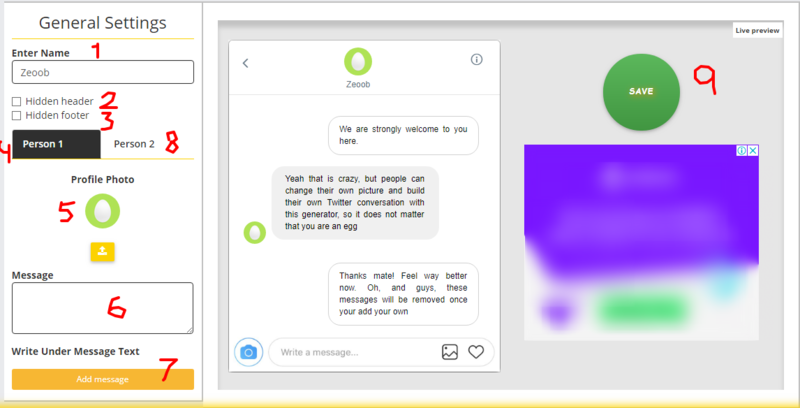 Once you have created your own desired fake Instagram Chat, then just click on “Save” button to generate screen-shot of your fake chat, and to share with your friends on Fackebook or download chat. Initially i usually used simitator, but came here on zeoob. Now never went back to simitator. Its far better than zeoob. Hallo geweldige tool, ik ben er echt dol op.